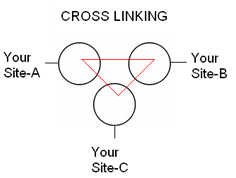 Cross linking can get you the much coveted inbound links from a related site. But if you own multiple domains, then make sure that you do things in the right way to gain the maximum advantage. Unique Content- Post the Panda in Google and similar algorithm tunings of other search engines, links must come between quality content. So you must ensure that each site of yours has unique, original content. Only then can the two domains seem different- (for the user too!). If the visitors guess that you both the domains are from the same origin, then they will not explore further. Similar Themes- The content has to be different, but not the theme of the sites! Otherwise how will the sites be related and relevant to each other. For example, you can have a spa website, and the other can be a spa-massage and facials website. This way you will promote better link quality through cross linking- as the sites now complement each other. User Experience- Enhance it. That is your purpose here. Link your unique content domains for the users, so that they can learn more than what they came for. Human visitor is your focus and not PageRank. You must provide the visitors the options to visit other sites that will be useful to them. Do it for the users, and the engines will follow soon. Anchor Text For Cross Linking- You must link the domains together with keyword rich anchor text. This will be good for both the users as well as the search engines. People use anchor texts to see where they are going next and what is the next site all about. As for the search engines, the keyword rich anchor text in cross linking, will be more appealing to them. The spiders will also get a clear picture with these anchor texts. Make It Seem Natural– The visitor is no fool. He will notice the links that have been added on top of the write up, just for pushing things. So that is why you must place your links where they naturally fit into the website. This easy and obvious fit will make it easier for the user to go on to the other site. But there is a catch here, you need to make sure that you keep your domains separate in the eyes of the search engines. You have to work towards reducing the affiliations between sites. The process to do the same begins with understanding how do search engines arrive at the affiliations between the two sites. IP Address – This is a basic and right on the table signal that creates affiliation. So, to make sure that engines consider your domains separate, you must have each domain you plan on linking on its own unique C-Block or C-Class IP. When each domain name is hosted with a separate hosting service, the search engines will not affiliate them. Also if possible register the domains to different people. Link Affiliation- If you have created sites just to cross link them together, then the engines will surely get a whiff of the same, and you may be penalized by the engines too. The ‘link ring’ will seem suspicious to the engines as well as the users. Make sure that you do not provide links form and to your domains with a single keyword. For instance, if you always link to your spa-massage-facial site with ‘dermabrasion’ as a keyword, and to your spa site with ‘aromatherpy’, then the engines will get to know that your sites are affiliated. If all your sites are cross linked with no other links from and to other/outside sites, you stand to be penalized by the engines. Do Not Spam- even on your own sites. Do not link between every page and secondly keep the number of links between sites at a minimum. Cross linking can be really beneficial for you, if you have related sites. This will not only lead to a better user experience, but also a chance of a better rank from the search engines. Stick to quality and relevant content- stay away from over linking and you will be fine. Is there any problem with linking between 2 sites you own, once, if they offer complimentary services? I am not suggesting multiple links going from one to another, simply a one way flow. Surely G doesn’t mind that – even if they are on the same C Block?